Are you just starting out on your journey to discover your family roots…or are you one document away from solving a mystery of one of your Revolutionary War ancestors? Wherever you are in your genealogical process, we’re here to help. 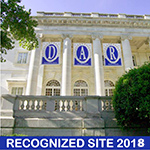 DAR members come from a variety of backgrounds and interests, but all share a common bond of having an ancestor who helped contribute to securing the independence of the United States of America. Any woman 18 years or older, regardless of race, religion, or ethnic background, who can prove lineal descent from a patriot of the American Revolution is eligible to join. Members are vibrant, active women who are passionate about community service, preserving history, educating children, as well as honoring and supporting those who serve our nation. The Margaret Gale Thornton Chapter NSDAR holds weekday evening meetings so members who work, are the CEO of their home, or want their weekend free can easily take part. So join us for dinner and DAR!